I’d like to dedicate this blog to our friend Val who is enduring some pretty nasty treatment for breast cancer at the moment. 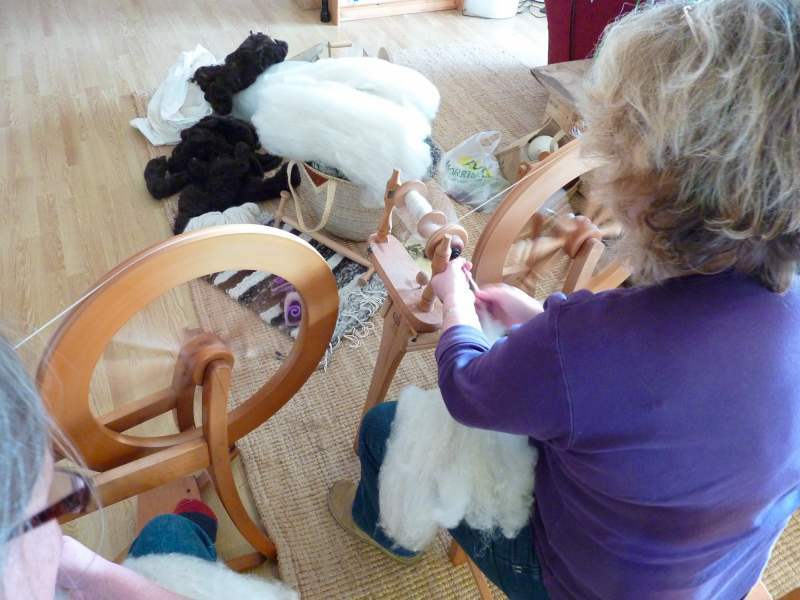 We’ve finally got around to spinning some wool and it’s on an Ashford wheel that Val kindly gave us a while ago. We liked the idea of spinning our own wool but we didn’t know how and, being busy people, we’d only flirted with trying to find someone locally to teach us. 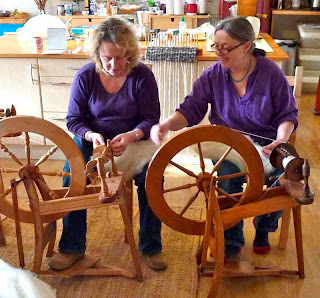 Serendipitously, one of our latest volunteers is a competent spinner and turned up well equipped to teach Gabrielle, with her two wheels, along with a lazy Kate and a niddy noddy. We started the morning making sausages, then Andrew and I went off to our woodland to construct a bridge out of reclaimed timber (see next blog) leaving Sue to teach Gabrielle how to spin. While pedalling gently, carded wool is teased into a hole and magically twisted into a thread, which is wound onto a bobbin. With two bobbins full and mounted on the lazy Kate, the spinning wheel is turned in the opposite direction to ply the two threads together, the wool being wound onto a third bobbin. The wool is then taken off the bobbin and wound onto the niddy noddy giving a lovely skein of wool. a city dweller, un citadin. Woolly jumpers (more likely a polar fleece) and cuts of meat were something I went to the shops to buy. Now, we home rear practically all the meat we eat but, apart from a very rustic Russian-style hat that Gabrielle made me out of felt and rabbit skins, we still buy clothes. 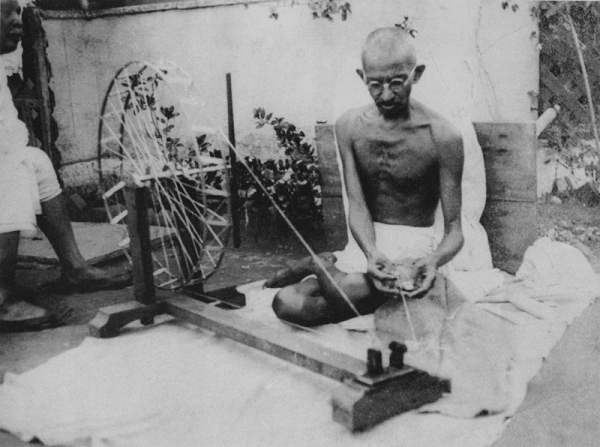 Can I now report to you that, in searching for independence and self-sufficiency along Swadedeshi lines, we’ve taken up our charkha and are going to start spinning our own clothes ? · I will research and investigate ethical fashion brands and alternatives to the high street. · I will not accept the normal 'we are working towards better conditions' excuses from big brands when it comes to sweatshops. If there is any doubt that anything is made those conditions I will not go anywhere near it. She’ll will be posting regular updates of her “struggle” as well as profiling ethical brands and ideas on her blog. I’m sure that Gandhi would approve of Gabrielle’s and Christina’s efforts. I am with you in spinning endeavours. Sheep shearing for the first time delivered a pile of fleeces I didn't know what to do with. So I have learnt to spin using a Kromski spinning wheel. Now all I have to do is find something to make with skeins of wool I have in my stash! Will watch your blog with interest to see what ideas you come up with! I was thinking of asking nannie to knit me something, maybe for next autumn now that i can't buy my knit-wear in Topshop! Maybe mum could make me something now too! I'm new to spinning as well. Your skein of wool looks excellent. I'm not quite that standard yet! 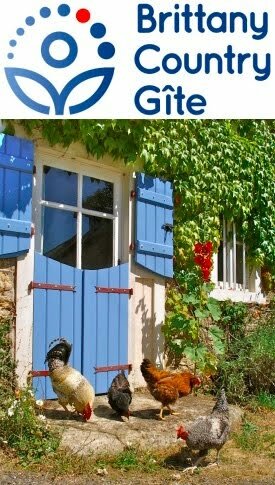 Aiming towards meat and veg self sufficiency ourselves so will be reading with you with interest from now on. Thanks for all you comments. 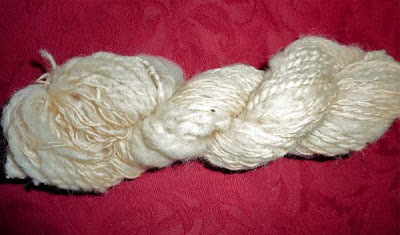 Vera, have you any pics of your wool on your blog. Christina, you'll have to wait a while as I fear our current product is way to rustic for your fashion sensibilities. Stephanie, I see you've got alpacas. How do you shear them?